Well, folks, here’s a pretty cool surprise that showed up in my inbox this weekend. I get updates at least once a week from Pittsburgh-based promoters Opus One Productions, but since they deal in events that range literally all across the musical spectrum, the majority of the information they contain usually is not of any interest to me. This time, however, the update pertains exclusively to metal shows, and (as you can tell from that headline) it includes some pretty huge names in the metal world, all coming to Pittsburgh! All three shows — a co-headline of Dying Fetus and The Faceless in early March, GWAR on Saint Patrick’s Day, and Behemoth in mid-April — are taking place at Mr. Small’s Theatre in Millvale (just a few miles northeast of the city on Rt. 28). If you haven’t been there before, I’d highly recommend catching a show there. It has been converted from an old church, and has a lot of the original architectural features including a real high cathedral ceiling; I don’t know if that’s the reason why, but in any case, the place has pretty great acoustics. Plus, it’s got a pretty intimate feel to it (only holds a few hundred people) but at the same time it’s big enough that you usually don’t feel too claustrophobic (for all-ages or 18+ shows, there is a wooden half-wall barrier that separates the bar from the rest of the floor area; I usually end up hanging out behind here, since you can get a great view of the stage but it’s usually not too crowded). After the jump, catch all the details of the events. If you aren’t local to Pittsburgh, take heart in knowing that all of these great bands are currently touring the U.S.; check out their Facebook pages or websites (most of which are linked in the information below) to find the full tourdates and see if there is also a show in your area. If you live outside the U.S., then piss off! You surely have awesome tours and festivals in your area all the time! Let me savor the thought of having these few visit my city, this time. This entry was posted in Pittsburgh, Shows and tagged Behemoth, Decibel Magazine, Dethlehem, Dying Fetus, Ghoul, Goatwhore, GWAR, In Solitude, Last Chance to Reason, Mr. Smalls Theatre, Municipal Waste, Opus One Productions, Pennsylvania, Pittsburgh, The Devil's Blood, The Faceless, USA, Volumes, Watain. Bookmark the permalink. 6 FREE CDs… It’s a Doom Metal Extravaganza! Enter to Win Now! 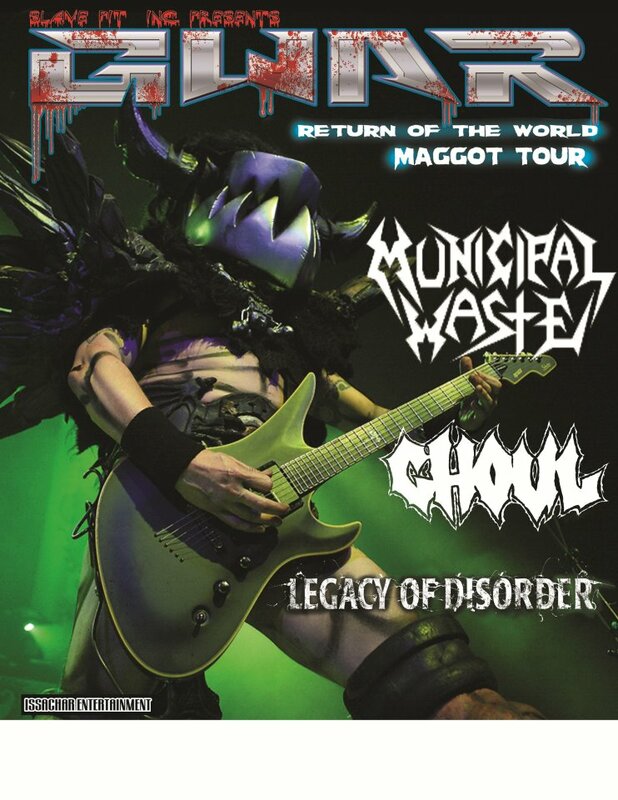 After April 5th when Gwar hits your city be sure to check them out and support opening act, Legacy of Disorder. Good friends of ours and this is their first tour like…ever. Great band and great guys. I did read about that somewhere, but I guess I forgot when I was writing this up, because it wasn’t mentioned in the announcement I was copying the info from the show they’re playing here is before April. But everyone else should totally check out that link to find out when this tour will be hitting your area, because here’s just one more reason not to miss it! Thanks for the reminder/correction, Rob!